The FlowVis by H2Flow Controls Inc. (formerly Emotron) has arrived on the market with many of the issues of other models resolved. It has also received NSF 50 Certification and is as accurate as a digital flow meter. Finally we have an accurate, reliable, and affordable Flow Meter for the pool industry. The FlowVis is two products in one, both a flow meter and a check valve. It also will display your velocity, showing between 5fps, 7 fps, and 9 fps. The FlowVis has NO RESTRICTIONS on installation regarding the distance from Turns and "T"'s. No longer are 90's, 45's and T's an issue.Other models of flow meters required 10 times the pipe diameter before the flow meter and 5 times the diameter after the flow meter for a basic read of flow. For a 2" installation this totals 30" of straight run, free and clear plumbing pipe. ( 10 x 2" + 5 x 2" = 30"). I know for most of us in a tight equipment room, this can be a rarity. The FlowVis Flow Meter has no restrictions regarding the location of the flow meter. It can be installed between two 90 degree turns and still give an accurate reading. The is revolutionary for the pool industry. In this day and time for our industry, where Variable Speed Pumps are becoming the industry standard, (and soon, more than likely the requirement), it has never been more important to get an accurate read on the flow of you pool, spa, or water feature. Without an accurate flow rate, your pool can quickly become a mess. The FlowVis flow meter allows you to quickly install, accurately read the flow rate, and set your new variable speed to the correct speed to maintain the required flow. 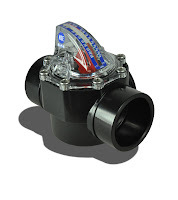 I have been asked quite often, "Where can I get the new H2Flow Controls FlowVis® Flow Meter with Check Valve?" Since this has become the only NSF Certified flow meter for swimming pools, there has been a lot of demand for them. The FlowVis®, by H2Flow Controls is easy to install since there are NO installation restrictions. You can actually put the FlowVis® right between two 90 degree elbows and the flow meter still reads as accurately as a digital meter. Congratulations to H2Flow Controls Inc (Formerly Emotron USA) for receiving NSF 50 Certification for the FlowVis flow meter. NSF reports conclude FlowVis has a staggering average accuracy of 2.01% that is completely unaffected by it's proximity to pipe fittings! 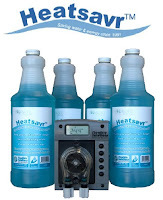 I have used this for multiple applications, finding it to be perfect for heater flow monitoring and small commercial, such as hotel pools flow monitoring. When used in conjunction with an Aquatic Variable Frequency Drive, (the Eco-Flow-C) or a variable flow pump, it is an essential piece of the puzzle to confirm you have the correct settings on your drive.